Not to be confused with Ted Andersson. Edward Walton "Ted" Anderson (17 July 1911 – 23 March 1979) was an English footballer, who played at either full-back or wing-half. Anderson was playing for Worksop Town when spotted by Wolverhampton Wanderers, moving to Molineux in December 1929. He made his league debut on 11 March 1931 in a 3–0 win over Port Vale. However, the three games he managed during this season proved his only for the club and he moved to Torquay United in December 1931, where he made his debut on Boxing Day in a 3–1 defeat away to Queen's Park Rangers. Worksop Town Football Club is an English football club based in Worksop, Nottinghamshire. They play in the Premier Division of the Northern Counties East League at level 9 of the English football league system. They are nicknamed the Tigers, and usually sport an amber and black home kit. Wolverhampton Wanderers Football Club, commonly known as Wolves, is a professional football club in Wolverhampton, West Midlands, England. Formed as St Luke's F.C. in 1877, they have played at Molineux Stadium since 1889 and compete in the Premier League, the top tier of English football, after winning the 2017–18 EFL Championship. Molineux Stadium in Wolverhampton, West Midlands, England, has been the home ground of Wolverhampton Wanderers Football Club since 1889. The first stadium built for use by a Football League club, it was one of the first British grounds to have floodlights installed and hosted some of the earliest European club games in the 1950s. He remained a regular that season, replacing Bob Smith, and was ever-present the following season as Torquay finished in 10th place in Division Three (South),  their highest finish so far. In June 1933 he was signed by Second Division West Ham United, making 26 league appearances (2 goals) before moving again, this time to Chester in June 1935. In two years at Chester, he made only 23 league appearances, before leaving for Tranmere Rovers in July 1937. Robert Smith was an English professional footballer. Born in Walkden, he is notable for becoming the first Torquay United player to make 100 Football League appearances. Chester City Football Club was an English football team from Chester which played in a variety of leagues between 1885 and 2010. The club, which was founded as Chester F.C., joined the Football League in 1931. Over the next eight decades, the club spent most of its time competing in the lower divisions playing its home games at Sealand Road (1906–1990). It was renamed Chester City in 1983. The club moved to the Deva Stadium in 1992 after playing two seasons of home games at Macclesfield Town's Moss Rose. Chester won the Conference National in 2004, its only league title. He helped Tranmere to the Third Division (North) title in his first season, making his debut in a 5–0 home win against Carlisle United on 18 September, and was a member of the team relegated straight back down again the following year, though only playing 7 games in the Second Division. The war interrupted his career, but he appeared more frequently for the Prenton Park side after the league restarted in 1946, going on to make a total of 73 league appearances for Rovers. 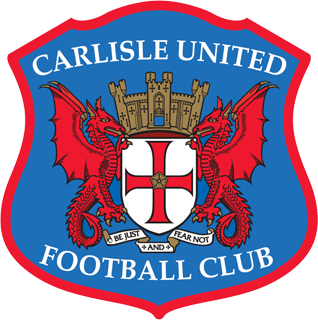 Carlisle United Football Club is a professional association football club based in Carlisle, Cumbria, where they play at Brunton Park. The team play in League Two, the fourth tier of the English football league system. Formed in 1904, they have won three league titles and two cup competitions in their history. They played in the then First Division in the 1974–75 season. The club has reached the final of the Football League Trophy 6 times, more than any other team, winning it on two occasions in 1997 and 2011. Prenton Park is an association football stadium in Birkenhead, England. It is the home ground of Tranmere Rovers F.C., Liverpool F.C. Women and Liverpool F.C. Reserves. Its main tenant Tranmere Rovers F.C. moved here in 1912. The ground has had several rebuilds, with the most recent occurring in 1995 in response to the requirement of the Taylor Report to become all-seater. Today's stadium holds 15,573 in four stands: the Kop, the Johnny King Stand, the Main Stand and the Cowshed. As the 1947/48 season progressed, it appeared that Anderson had played his final game for Rovers. However, he finally reappeared in the league side on 3 January 1948 playing in a 4–0 defeat away to one of his previous clubs Chester. His final league appearance came on 27 March that year, playing at right back in a 3–2 home defeat by Stockport County. The 1947–48 season was the 68th season of competitive football in England. Stockport County Football Club is a semi-professional football club in Stockport, Greater Manchester, England. Formed in 1883 as Heaton Norris Rovers, the team adopted their name in 1890 after the County Borough of Stockport. They have played at Edgeley Park since 1902, traditionally in blue and white, and are nicknamed The Hatters after the town's former hat-making industry. New Brighton Association Football Club is the name of two football clubs from the seaside resort of New Brighton, in Wallasey, Merseyside in England. The original club founded in 1921 were members of the Football League from 1923 until 1951, playing 21 seasons in Division 3 North but were disbanded in 1983. In 1993, a club with the same name was formed and played in the West Cheshire League, until folding in 2012. Wrexham Association Football Club is a professional association football club based in Wrexham, Wales that plays in the English football league system. Based on the club's recorded formation date of 1864, they are the oldest club in Wales and the third oldest professional football team in the world. Since August 2011 Wrexham have been a supporter-owned football club. Raymond Mathias is an English football coach and former player. He has spent most of his career in the lower leagues of English football. Mathias played for Tranmere Rovers between 1964 and 1985, and remains their record appearance holder having played 637 games for the club. After his retirement he spent three years as manager of Wigan Athletic, briefly returning to the role for the 1998–99 season; between these two spells he returned to Tranmere as a coach, and later managed the side before moving on to Chester City in a caretaker role. He was appointed interim manager of Stockport County on 9 March 2011 until the end of the season, when County were relegated from the Football League for the first time in 106 years. Owing in part to an impressive home record, Mathias was appointed full-time County manager in May 2011, but departed just two weeks later following the takeover of the club by Tony Evans. Andrew Mark Robinson is a former professional football player who played as a winger. Gary Brabin is an English former professional footballer and manager who is now assistant manager at Blackpool. Thomas Cowan Anderson is a Scottish former professional footballer. He played as a forward, and was noted for his extremely fast pace. George Cook was an English professional footballer. He was born in Shankhouse, Northumberland. Evan David Horwood is an English footballer who plays as a defender for Welsh Premier League club Bala Town. Aidan Robert Newhouse is an English former footballer. A forward, he scored 15 goals in 113 league games in an 11-year career in the Football League. Edward Michael Bishop is a former professional footballer who played as a Midfielder. 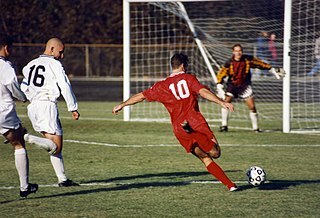 He played in the Football League in England for Tranmere Rovers, Chester City and Crewe Alexandra and also played and managed in non-league football. He is the elder brother of comedian John Bishop. David Kennedy is an English former professional footballer who played as a Winger. He made more than 250 appearances in The Football League for Tranmere Rovers, Chester and Torquay United. Thomas John "Tommy" Jones was a Welsh footballer. Although he began his career in Wales, he is best known for the time he spent as a player in the English Football League. William Robert Meacock was an English professional footballer who made 180 appearances in the Football League playing for Torquay United, Tranmere Rovers, Lincoln City and Birmingham. He played most frequently at centre half, but also appeared as a right half or inside right. James Thomas Norwood is an English professional footballer who plays as a striker for Tranmere Rovers, having previously played for Exeter City and Forest Green Rovers. Myles Anderson is an English professional footballer who plays for Hartlepool United as a defender. Anderson has been at several clubs in his career, having played in Scotland, England and Italy. The 1982–83 season was Colchester United's 41st season in their history and second consecutive season in fourth tier of English football, the Fourth Division. Alongside competing in the Fourth Division, the club also participated in the FA Cup, the League Cup and the Football League Trophy. The 1965–66 season was Colchester United's 24th season in their history and their first back in the fourth tier of English football, the Fourth Division, following relegation the previous season. Alongside competing in the Fourth Division, the club also participated in the FA Cup and the League Cup. Thomas Edwin Jones (1891–1953) was an English professional association football player in the years both prior to and after the First World War. He made over 100 appearances in The Football League for Bristol City. He also played over 60 times in the Southern League for Exeter City. Frank Thomas Perfect was an English professional footballer who played as a full back for various clubs, including Mansfield Town, Tranmere Rovers and Southampton in the 1930s. Shamir Daniel Sanchez Fenelon is an Irish footballer who plays for Aldershot Town, mainly as a winger, but also as a striker. Joseph Sewell was a footballer who played at outside right in the Football League for Darlington. The 2016–17 National League season, known as the Vanarama National League for sponsorship reasons, was the second season under the new title of National League, thirteenth season consisting of three divisions and the thirty-eighth season overall. ↑ Michael Joyce. Football League players' records 1888 to 1939. SoccerData. ISBN 1-899468-67-6. ↑ Edwards, Leigh (1997). The Definitive Torquay United F.C. Essex: The Association of Football Statisticians. ISBN 1-899468-09-9. 1 2 Gareth M Davies and Peter Jones (1999). The Racecourse Robins. Davies and Jones. p. 353. ISBN 0-9524950-1-5.